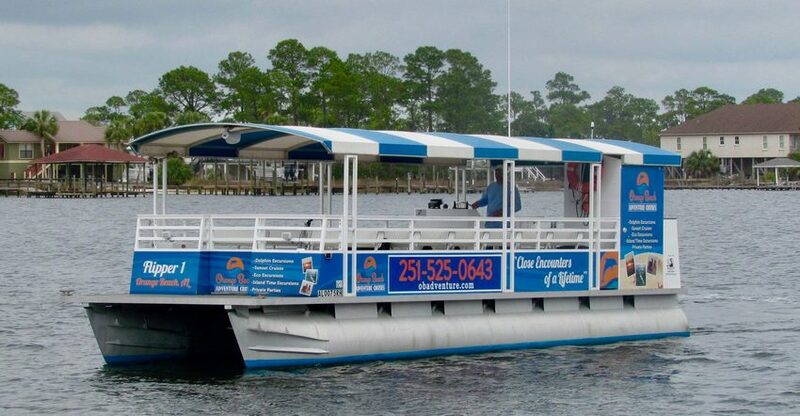 Orange Beach Adventure Cruise's boat, Flipper 1, is a 24-passenger USCG approved commercial passenger vessel. We offer very comfortable upholstered seating that can be arranged in small groups facing forward or rear. Passenger comfort and personal attention to every detail is our #1 priority. There is a full size marine bathroom (head) with running water and many of the comforts of home. We have a Bluetooth compatible stereo system available for your private party and our smaller vessel allows "Close Encounters" with nature traveling in the bays and bayous of the greater Orange Beach and Perdido areas.